In my last IDC post, you all joined in for an interesting discussion about food stigmas. I suspect there are stigmas about wild foods too, though Euell Gibbons did a lot to bring wild foods into the gourmet spotlight. I certainly enjoyed his books and still have my copy of Stalking The Wild Asparagus. In addition, I have a copy of Peterson Field Guides Edible Wild Plants in our homestead library. The wild onions pictured at left are a common sight. They seem to grow everywhere and it's not unusual to get a whiff of them whenever someone is mowing their lawn. ... and add a mild, pleasant flavor for my scrambled eggs. 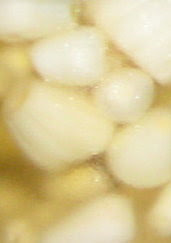 The little onion bulbs are like working with shallots and can be used the same way. I took the ones I didn't cook and made a fresh pickle with them, using leftover pickle juice. They do get stronger (hotter) as they get bigger. But they sauté nicely and make a nice substitute for garden grown onions. Once they flower, I'm thinking I'll be better able to identify the species. Medicinally, the wild onions are used for colds and respiratory ailments. The other thing we've been eating is sheep sorrel (Rumex acetosella), another common sight. I haven't found enough to cook a couple of servings by itself, but I've been adding it to cook with spinach. It adds a nice tangy flavor to it. I think it would be an excellent flavoring for fish too. Sheep sorrel is kin to dock and I read that it's juice can remove rust, mold, and ink stains from linen, wool, and wicker. I haven't tried this though so I don't know how well it works. Anyone? I've used "lawn onions" in cheese bread, and it was yummy- though my husband did look at it very doubtfully. He's firmly in the grocery store camp. 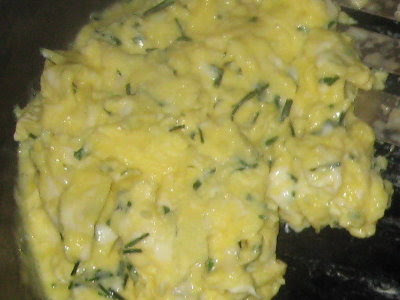 I love chives in my eggs gives them a little something extra! I like that you have some wild foods available to try out. The last pic is that in the lettuce/spinach family? We have SCADS of wild onion on our place; it seems to spread faster than everything but pop weed. I've wondered if they are edible; with your inspiration I'll have to try them, especially since I use a lot of onions. Are all varieties edible? Sue, good to hear from you! That does indeed sound yummy. Deep End, it's a member of the dock family (Rumex), but it's not related to lettuce (Lactuca). Michelle, as far as I know they are. I found no warnings about specific ones in my Peterson Guide. They do get stronger as they get older! wild garlic - I could roll around in wild garlic:)) and luckily my first three measly plants, which I bought have spread nicely by now! and of course all kinds of berries. I do have wild onions in the garden, too. I had a good laugh about some ornamental gardening tips lately, where they offer a special onion "Hair"! it's nothing but a wild onion, which forms air bulbs that look like heads with green hair, when they start to sprout! but nobody told the people that they start popping up everywhere:)) I do like sorrel too, but I usually shred it finely and put it into soups. I remember a childhood friend showing me how you could eat wild onions but I don't think I have done it since I've become an adult. We grow green onions in the garden now though. I need to look into the sheep sorrell and see if we have that around here. I grew up eating wild onions straight from the ground, although we have to make sure there was none growing in the pastures. Cows that eat wild onions give onion flavored milk and the cheese factory we sold our milk to didn't appreciate the added flavor. Favorite wild food, Morels and we have them up here. Might even see some soon if the weather cooperates. I tried planting onions last year but when I went to try to "harvest" one it was still as small as it was when I planted it...so I replanted it in hopes of it getting bigger. Bettina I would love to have wild garlic too. Interesting about the hair onion. I've not seen that one yet! Laura, the wild onions are a little more bother to prepare, seeing that they are so small. The onions I'd like to find are the Egyptian Walking kind, perennials, which would be easiest of all. Benita, what a job that must have been! As much as I love onion flavor, the one place I wouldn't want it would be in my milk! Theresa, I love mushrooms, but I've never thought about learning to identify the wild ones. We did get scads of different types last year. Renee, I found the same thing too. Those onion bulbs I planted last fall have done little except grow tops :( Like you, I stuck mine back in the ground to see what will happen. You are so full of information, I sure know who to come to. My hubby would love the onions! 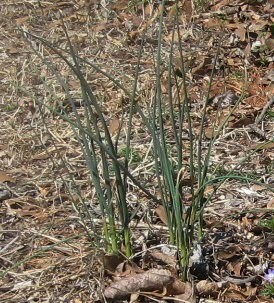 Wild onions growing in the yard - that's fantastic, I would love that! 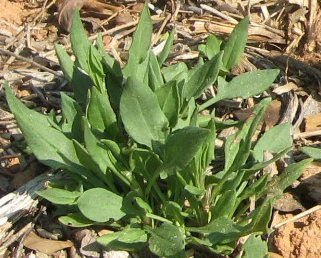 The children eat quite a lot of Rumex acetosea during summer, it is a tall plant and they chew the stem. We use wild chives in salads and of course all kind of berries. I've never seen a wild onion around here! We have ramps and wild leeks sometimes and of course I've harvested wild berries, raspberries, strawberries and low bush blueberries, although you do have to keep an eye out for the bears with the latter! Charlotte, I in turn would love to have some wild garlic around! The onions are very prolific. I've pulled a lot but hopefully there will be enough to reseed for next year. Nina, I would love all those berries......without the bears! I would also love to get some ramps. They do grow in my part of the country but I have yet to find any for planting. Hopefully one of these days. I've been laughing because I constantly have to hoe wild onions out of my garden. They grow like crazy. Kind of ironic to hoe them out of the onion patch. It never crossed my mind to eat them! I'll try some this weekend. I've just discovered sheep sorrel this season. It was growing in my herb garden in our summer home in the mountains of northeast Alabama (yes, we have mountains in Alabama - beautiful, very old ones). We've been eating it added to our spinach salads, and dinner guests ate it without knowing, complimenting the taste in the salad all the while! Today, I'm searching to see if I can blanch and freeze some for my freezer at home, to add to hearty winters soups and stews.....I'm definitely pinning your blog on my Foraging board; thanks! Lee, I should have read about you before my smarty comment about having mts in Alabama! I was searching about sheep's sorrel and commented before checking you out. I'm so happy to find your blog because you are near to me, or at least in the same general region. I have a couple of acres with a 100-year old farmhouse in Mentone, Al. Are you near? Grace, here I am, three years later and just now responding to your comment. I see your not blogging any more, too bad! Goodeating, thank you for commenting! I've been wondering about dehydrating sheep sorrel. It does add a nice tang to foods. Thanks for mentioning you have a foraging board. I'll have to find it and follow. Elaine, hello! We're not very close to Birmingham, two states away in fact. Still, we probably have a lot of forage edibles in common! I made a quick visit to your blog to return the visit and the comment, but see you haven't started posting yet. I hope you do!